On a routine visit to Wikipedia today I was greeted with a huge fundraising banner that covered half of the page. Really, click the link to see how huge that thing was. DEAR WIKIPEDIA READERS: This week we ask our readers to help us. To protect our independence, we’ll never run ads. We survive on donations averaging about $15. Now is the time we ask. If everyone reading this right now gave $3, our fundraiser would be done within an hour. Yep, that’s about the price of buying a programmer a coffee. We’re a small non-profit with costs of a top website: servers, staff and programs. Wikipedia is something special. It is like a library or a public park where we can all go to think and learn. If Wikipedia is useful to you, take one minute to keep it online and ad-free another year. Thank you. DEAR WIKIPEDIA READERS: This week we ask our readers to help us. To protect our independence, we’ll never run ads. What is the point of a site saying they don’t want to show ads, then covering up 50% of the screen with a request for money? 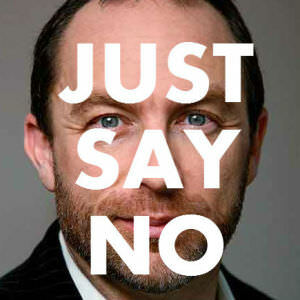 At least this year’s fundraising banners don’t have Jimmy Wales staring out at the reader like Big Brother. Now, I respect Wikipedia’s non-ad stance. They can’t very well make money on a site that was created through the free labor of its contributors, but for God’s sake show some decorum. We survive on donations averaging about $15. Now is the time we ask. If everyone reading this right now gave $3, our fundraiser would be done within an hour. 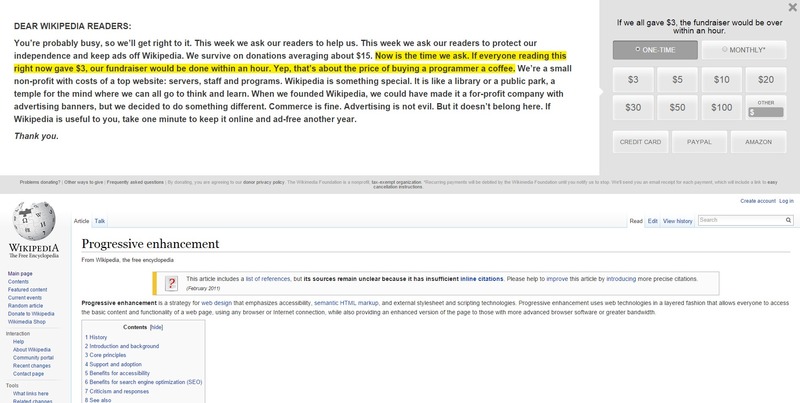 Money is not an issue of survival for Wikipedia. According to its latest annual report, The Wikimedia Foundation (WMF), the charity that controls Wikipedia, has $51 million in cash reserves ($28 million) and investments ($23 million). No-one can seriously claim that an organization that has $51 million in the bank is in “survival” mode. Yep, that’s about the price of buying a programmer a coffee. Note the focus on programmers. But programmers don’t make Wikipedia. Wikipedia’s core software is essentially unchanged since 2001 when the project started. Since then Wikipedia’s programming efforts have been a disaster. The Visual Editor (a tool that would allow WYSYWIG editing) was a failure. Editors still edit using tags and arcane code to create their edits. The recently introduced Media Viewer is universally hated. The people who really make Wikipedia are the unpaid volunteers, but hey get nothing from donations. Nothing, while programmers who don’t have a clue get paid. Is that really where your money should go? This is a flat-out lie. The WMF is not a small non-profit. It raised $46 million in donations last year and has 215 staff, over 130 of whom work in the Engineering and Product Development department. Yet all of the money spent on programmer salaries has produced no measurable change to the site’s quality. These programmers take up a huge amount of the foundation’s $20 million spent on salaries, salary payments that rose $4 million since 2103. The closest WMF gets to creating content is the almost $6 million was spent last year on awards and grants — mostly funding international and regional staff and workshops to celebrate Wikipedia, such as Wikimania. These grants have been described as “corrupt” by the WMF’s ex-director Sue Gardner. who said, “I believe the FDC [Funds Dissemination Committee] process, dominated by fund-seekers, does not as currently constructed offer sufficient protection against log-rolling, self-dealing, and other corrupt practices.” Oh dear. with costs of a top website: servers, staff and programs. The same KPMG report says that Wikipedia spent $2.5 million of its budget on hosting, almost unchanged since 2013. A closer look at the reports line items shows that the WMF spent almost $684,000 on furniture. That’s almost $3200 per employee. Your donations are going to golden chairs. Wikipedia is something special. It is like a library or a public park where we can all go to think and learn. I guess parks and libraries would be a lot less popular if you had panhandlers at the doors. Especially panhandlers who have more in the bank than you. If Wikipedia is useful to you, take one minute to keep it online and ad-free another year. Thank you. More weasel words. Wikipedia is already useful without the extra donations, and even if donations stopped tomorrow it would still be able to stay online, continue on cash reserves for years (with some salary cuts). Don’t donate to Wikipedia. It doesn’t need the money, and anything you donate will not go to the people who actually created the pages that you like. It doesn’t even go to the admins who help check the content. It doesn’t go to content creation at all. Your money goes to a group of incompetent programmers and a management team that jets around the world for “outreach”. When they are not jetting around they sit in their golden chairs, wondering why they only made less than 1% return on the $51 million they have in the bank. That’s right, they can’t even invest the money properly. The WMF’s bloated staff of do-nothings want to be rewarded for the value that they did not create. They are laughing all the way to the bank, while they try to guilt you into giving more so they can do even less. If you really want to help the WMF, give it less money so that it is forced to do more with less. If you don’t want to read about how Newslines compares, stop reading here. Here at Newslines we don’t have break your experience to beg you for money we don’t need to give to people who don’t deserve it. Our tiny engineering team (me and three part-time subcontractors around the world) have created a modern, multimedia content creation system. It wasn’t that difficult or expensive. The core WordPress software is created by a great team of committed open-source developers. Our contributors don’t have to use arcane tags, they don’t have to go through a post approval process that Beelzebub would have been proud to invent. Our writers are the people who drive this project forward and should have tools that make their lives easier. And one of the best ways to show respect is not to give out some crappy badges and pats on the back, but to give them money. Having previously paid out over $25,000 to hundreds of content creators for creating and verifying news on thousands of topics we are getting close to our relaunch as an open blockchain platform that lets writers and editors generate ongoing revenues from adding and verifying news, giving real money back to the people who deserve it. That’s only fair.